Sunday January 21st 1893 I got the work done up and things fixed for dinner before we went to church. I had the Woolf family invited to dinner. In the afternoon Mary and I went to Love Feast before they went home. We read till church tome and after coming home from church had lunch. The weather turned very much colder in the afternoon. 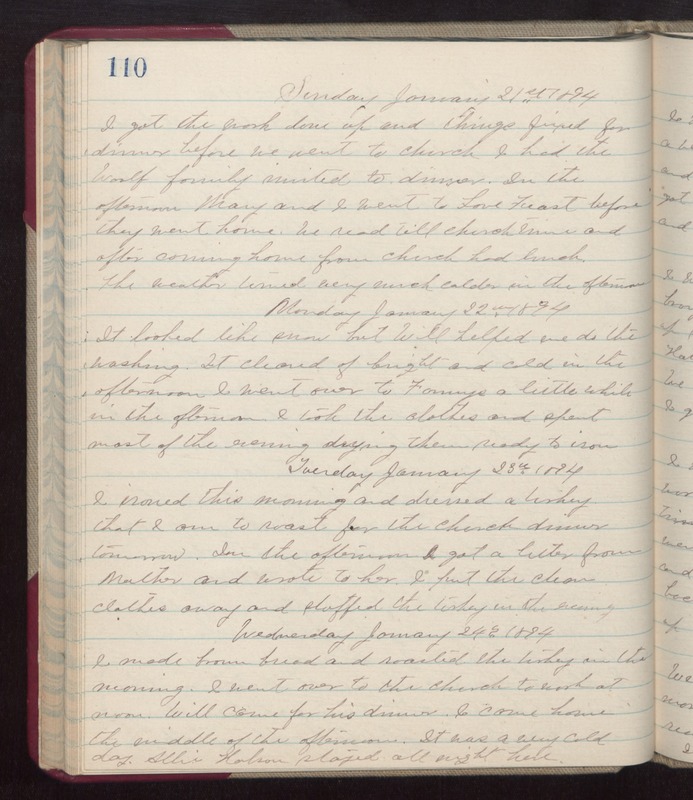 Monday January 22nd 1894 It looked like snow but Will helped me do the washing. It cleared of bright and cold in the afternoon. I went over to Fannys a little while in the afternoon. I tool the clothes and spent most of the evening drying them ready to iron. Tuesday January 23rd 1894 I ironed this morning and dressed a turkey that I am to roast for the church dinner tomorrow. In the afternoon I got a letter from Mother and wrote to her. I put the clean clothes away and stuffed the turkey in the evening. Wednesday January 24th 1894 I made brown bread and roasted the turkey in the morning. I went over to the church to work at noon. Will come for his dinner. I came home the middle of the afternoon. It was a very cold day. Allie Halson stayed all night here.